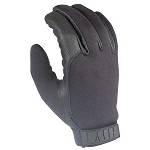 The KLD100 has the classic look and feel of an all leather duty glove with a more modern functional design. The “contour cut” and high-grade aniline goatskin make the KLD100 an extremely comfortable highly abrasion resistant glove. For the protection of the duty officer, a full Kevlar® liner is added for cut resistance.